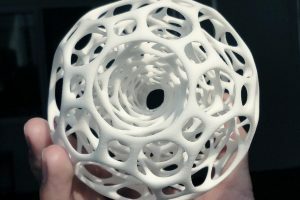 3D printing, also known as additive manufacturing (AM), refers to processes used to create a three-dimensional object in which layers of material are formed under computer control to create an object. Objects can be of almost any shape or geometry and are produced using digital model data from a 3D model or another electronic data source. Thus, unlike material removed from a stock in the conventional CNC machining process, 3D printing or AM builds a three-dimensional object from computer-aided design (CAD) model (STL, STP, STEP, SLDPRT) by successively adding material layer-by-layer. The term “3D printing” originally referred to a process that deposits a binder material layer-by-layer onto a powder bed with inkjet printer heads. More recently, the term is being used in popular vernacular to encompass a wider variety of additive manufacturing techniques. United States and global technical standards use the official term additive manufacturing for this broader sense. ISO/ASTM52900-15 defines seven categories of AM processes within its meaning: binder jetting, directed energy deposition, material extrusion, material jetting, powder bed fusion, sheet lamination and vat photopolymerization.